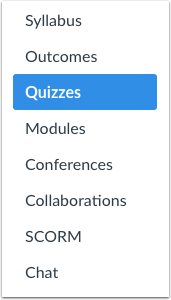 When you link a Question Bank to a Question Group, you will see all of the Question Banks that you have built in the same course, and those you have bookmarked in other courses where you are the Instructor. You will also see Question Banks that have been added by your administrator to your sub-account, which makes it easy for instructors in the same department or program to share resources. Canvas will reference your chosen bank of questions as each student takes the quiz. Each student will get a specified number of questions, pulled from the bank at random. The number of questions and point value per question is specified when the question group is created. For instance, if you want to use questions from the English Department and they have 7 questions in their Question Bank, but you only want the Question Group to display 2 questions, Canvas will randomly pull 2 of the 7 questions as each student takes the quiz. 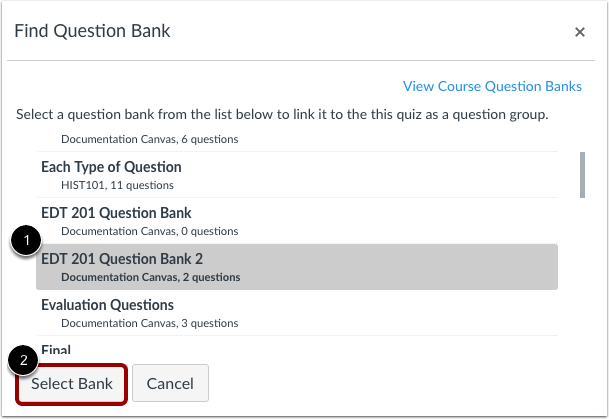 When linking a question bank to a quiz, be sure to make changes within the question bank before the quiz is available to take. Although you can make changes to the question bank after a quiz is published, students who have already opened or completed the quiz will not see any of the changes, which may affect their grades. Students who begin their quiz after the changes are made will see your updates. Questions that are linked to a Question Bank cannot be regraded since they may be used in more than one quiz. Give your question group a name . Decide how many questions you want Canvas to randomly select from the group  and the number of points assigned to each question . Quiz point values support up to two decimal places. Entering more than two decimal places will round the point value to the nearest hundredth. If you set a question group to randomly select questions from the question bank, the question bank and questions will not be included in quiz exports. The QTI file will download quiz details, but no questions will be included. Confirm your Question Bank is linked to the question group . Click the Create Group button . Previous Topic:How do I create a quiz by finding questions in a question bank? Next Topic:How do I create a Multiple Choice quiz question? Table of Contents > Quizzes > How do I create a quiz with a question group linked to a question bank?